So, the time has finally come for us to paint "the pink room." DH is a person who likes to have everything done way before it needs to be...he was never a boy scout but he pretty much lives by the motto, "always be prepared" when it comes to house renovations. So after we found out we were pregnant last time we went to Home Depot and picked out a few different paint colors for the nursery. 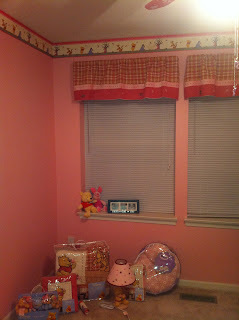 Since I am an enormous Winnie the Pooh fan we settled on 2 colors....Piglet Pink for a girl and Eeyore Blue for a boy. So when we went to our 3D ultrasound in early January that time we found out that we were having a girl...on our way home from the ultrasound DH stopped at Home Depot and bought 2 gallons of Piglet Pink. Within a few days the room was transformed from a brownish color office to bright Piglet pink nursery complete with valances and the saying, "Always kiss me goodnight" above the bed (I almost thought it was too pink, but I didnt want to tell him that.) It was a room perfect for a princess.....but a room that she never got to see. When we got home from the hospital I kept that door closed for a long time, it just hurt too much to go in there. It was beautiful and it broke my heart that she was gone and would never actually get to see that room. 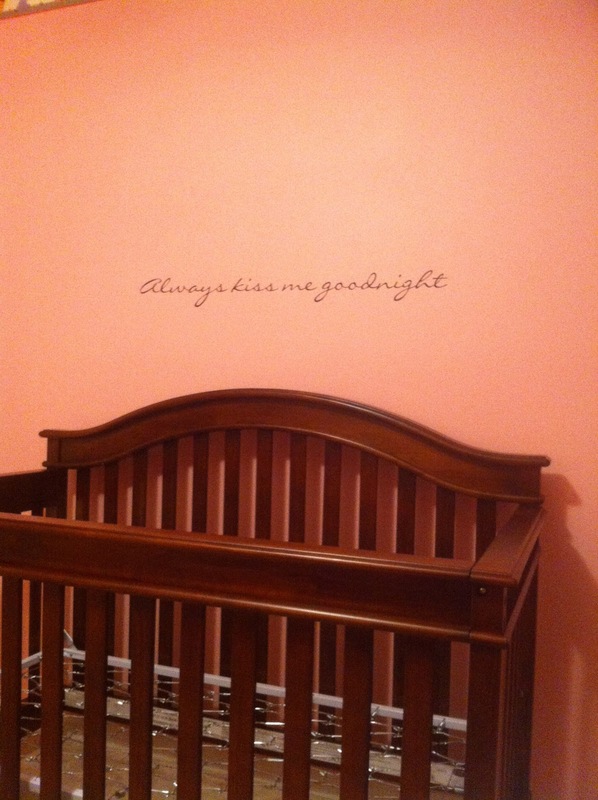 We decided that, if we ever got pregnant again, we would keep a small square of the wall pink for Bristol, so that it could be "both" of their rooms. When we got pregnant this time we knew that we didnt have to worry about the color to paint it. If the baby was a girl we would leave it the same, if it was a boy we would paint it Eeyore Blue. So, when we learned we were having a boy we didnt even bother to look at colors, we knew what we wanted. So, imagine our disappointment when we walked into Home Depot and they no longer made Eeyore Blue....if we wanted it we would have to find the exact color info online and then they would make it for us. So, DH googled it and a few seconds later he had the color info...or so he thought. We had them make the paint and, though it looked a little too purplish for us, we bought it and DH spent an afternoon turning the pink room into a blue room.....except that well, it wasnt blue.....it was a really pretty shade of purple. And of course, it was such a pretty shade we purchased 2 cans of the darn stuff!!! We decided that the purple just wasnt going to work, so a few days later DH went back to the Home Depot to buy an actual blue paint (one that matched the cute Winnie the Pooh valances we had ordered). We were pleasantly surprised when they told him that he could return the unused can of purple paint. And, just a day later we had a blue room. That night when I got home from work I was helping DH put up the boarder....and though this boarder was going up easier than the last one, this one was vinyl and it didn't bend like the paper one did. About halfway through the boarder project I was staring at the opposite wall when it occurred to me that there wasn't a pink square...(Im sure this may seem a bit melodramatic but well, Im hormonal and still grieving) it felt like losing Bristol all over again. I couldnt breathe and I just started sobbing uncontrollably...the wail of a mother who lost a child. DH hugged me and asked what was wrong. It took me a minute to calm down enough to tell him...he told me that he was going to do the pink square but he didnt have a way of making it look nice so he didnt. 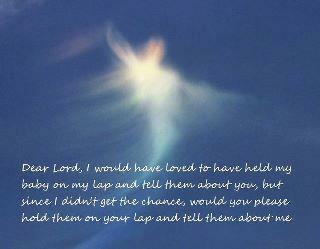 Im sure thats probably 1/2 true...but I think part of him was worried that every time Id walk into the room Id get sad. He told me we still had the pink paint and he'd paint it for me...but that wasnt the point. I wanted it to be left from when we painted it for Bristol...by painting over the pink it felt like we were painting over her. **Im in no way trying to say that DH had anything but the best of intentions when painting the room, but it was hard for me. I'm doing a little better now, its just so hard. And I think having a nursery finished makes it even harder on me...if we lose this baby too then we are gonna have a blue room and no baby. Maybe its just me, but I think losing the baby after the room is complete is harder...its a constant reminder that your baby didnt make it. 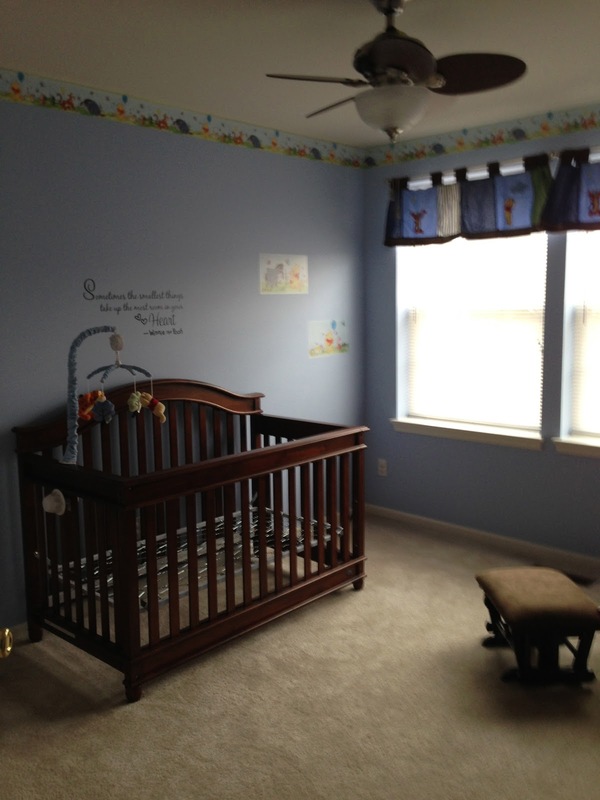 It's a beautiful room though...one that I hope he will be able to see in a few months.